3 voyageurs ont réservé aujourd'hui. Vous souhaitez poser une question à l'établissement The Grand Residence ? 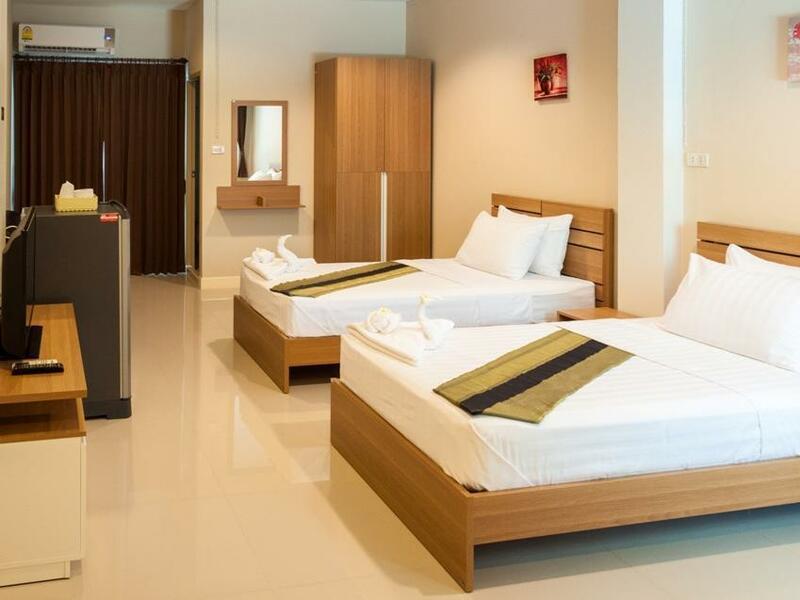 Parfait pour le plaisir et la détente, le The Grand Residence se trouve dans le quartier de Nakhonratchasima centre à Nakhon Ratchasima. De là, les clients peuvent facilement se déplacer et profiter de tous les avantages offerts par cette ville dynamique. Les hôtes de cet établissement auront le plaisir de pouvoir visiter facilement les points d'intérêt principaux de la ville : The Mall Ratchasima, Parc aquatique de Boong Ta Lua, Klang Plaza - Jomsurang. Au The Grand Residence, l'excellent service et les équipements de qualité contribueront à rendre votre séjour inoubliable. Cet établissement abrite de nombreux équipements, qui satisferont les clients les plus exigeants. Les chambres de l'établissement ont été aménagées selon les plus hauts standards de confort et d'ergonomie et comprennent pour certaines les équipements suivants : télévision écran plat, miroir, serviettes de toilette, accès internet (sans fil), internet sans fil (gratuit). Grâce au vaste éventail de loisirs proposé par l'hôtel, les hôtes ne manqueront pas d'activités durant leur séjour. Services hors pair et adresse prestigieuse sont le lot du The Grand Residence. L'hôtel fournit un accès WiFi pour 2 utilisateurs par chambre sans supplément. I found this hotel to be a great place for cheaper price I paid. I would definitely stay there again. 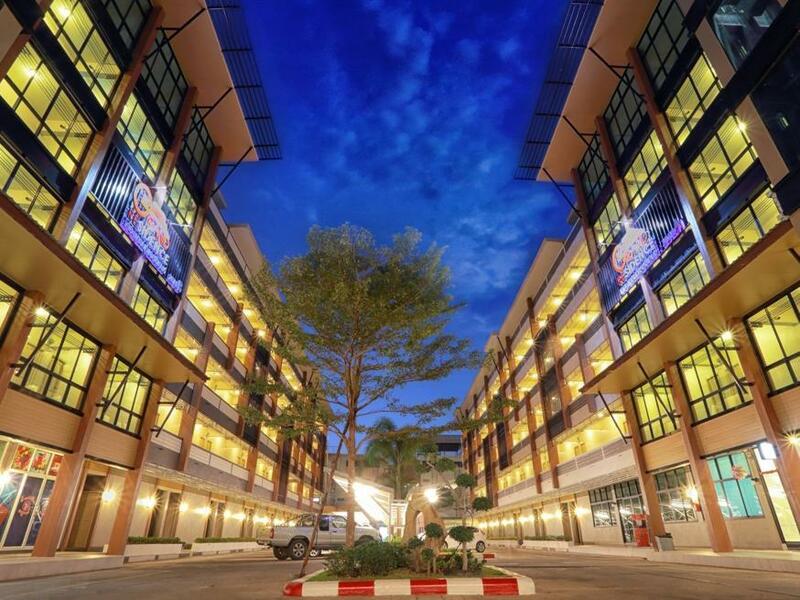 Close to restaurants, the famous night market, banks, western food restaurants. Very helpful staff and professionally managed. 2nd stay here to shop at saveone night market. easy covered parking inside complex. efficient staff, 200B deposit at check-in may bother some people. large clean room, comfortable bed, lots of hot water for shower, wifi good, tv has no english channels. great value! stayed on weekend to visit save one night market. easy to find with good signage and just off the main highway. easy parking inside the complex. efficient check-in but must pay a cash key deposit. room large clean and good furniture and bedding. no English TV channels and internet slow in the evening. night market is on highway only 1/2 km away but no sidewalk and heavy traffic. from the market lots of public transport to most parts of the city. for the price an excellent budget option. Big place. Very basic but good price. Cheap and 10 minutes walk to saveone market. That is the good points summed up, the bad? As others have rightly stated in here, the WiFi is abysmal, speed non-existant. limit of 2 connections which have time limits, basically the worse WiFi I've ever encountered in many years in Thailand, if you need to use it then book somewhere else. no flexibility on early check in, only cold water for sink and shower, bed ok, TV ok. Cheap and rightfully so. Served its purpose for visiting the night market without needing to use the car. Mattress soft and sloping from the middle. Unlikely to visit the market again, thefeore no further need for this hotel envisaged. I live in Nakhon Ratchasima so I have never stayed overnight in the city. I wanted a good hotel to see Swatcat v Buriram. This hotel is only 3k from the stadium and is surrounded by shops, a big market, and even a Pizza Company. The hotel itself is huge but very organized. The room was very large with a balcony. I felt very comfortable while staying there. I only wish they had English TV channels, but besides that it was perfect. Close to metro station, good location with restaurants and convenient stores. Very helpful staffs. Comfy and clean room However, hotel was under renovation during my stay which cause minor inconvenience and there is no fridge in the room. Room condition is good, but I have to go outside for food. There is market nearby, but out of service in the night, except Lotus Express. They gave me wifi password, but I cannot use it. There were any others who had the same problem as me, but one of the staff told me it's not her problem. She can use it. One of her colleagues who had iPhone cannot use wifi either, but that's not her concern. I think it's just air-conditioned apartment, not hotel. I will not come back again. The room is cooling even without switch on the air-con. Is just within 5 min walk to reach the Korat night market. Staff is helpful even unable to speak well in English. They serving free sachet of coffee & malt drinks on the right side of reception. This is a difficult place to rate and review. The room was huge, but even with the furniture in it, which was enough, it seemed cavernous. The bed was big and very comfortable with the most luxurious doona (blanket) I've ever encountered. There's also a tv but no English channels, which is common in Thailand, a small sofa, wardrobe and decent sized fridge. But as you walk in the first half of the room is bare. I don't know how this could be remedied, as the entire place (and it's huge) is set up more for long stay, with excess rooms going to the hotel short stay side of the business. Like most of these places there's a fair bit of noise transference between rooms and floors. The bathroom in comparison to the room was tiny, Thai style with a shower beside the toilet and a small basin. The water pressure was incredible. There's also a small balcony. One really negative point was the inconsistency of the staff and their service. On check in it was great, no problems, during the busy evening period. But when it came to checking out it was poor. The girl who had to do the room check was obviously greatly put out by the chore, and took ages to return. Anyway, management, if you are reading, your staff need a little fine tuning in their customer service skills. Other than that it's pretty good value for the price, 400 baht per night is the walk in price and about what I paid on Agoda. It is a short walk to the incredible Save One markets, and just about every type of eating you could want. There is an in complex massage business but their prices, as is usual with in house things, were well up in comparison to those a short walk away. Still, when you're tired it's convenient. But that said if you are looking to enjoy the action of central Korat, it's quite out of the way, and would involve a journey of 4 or 5 kilometres, so definitely not a walk. The room was clean and value for the money. But the staff at the reception makes us feel unwelcome. So better not ask something, because you will disturb the sleep of the receiption ladys. So all in all location ok, room ok, but the staff is not exeptable. Thats the reason we will not come back here!!! We use this hotel for taking a break(bed without meals) on new year's eve. So quiet here and minimum service by this cheap price. Good for people who just want to stay one night on the way to or from Esan Area. The room is clean and new. There is no breakfast include. This hotel does suit the tourist who has own car because it is not in the city. I choosed to stay here because my propose to go to Nakornratchasrima is to visit my friend and shopping at Save1 night market that only 400 meters from the hotel (you can go there by feet). The car parking is quite ok, but I think there is not enough space for the long holiday season because the parking will be very pack. The staffs are nice and they will give us the first floor room. So it's convinced for you.